Artists of all skill levels will find much to inspire them in this detailed and practical guide. Margaret Eggleton takes us through easy to follow drawing stages, and includes advice on looking at the flower– not the paper– while drawing, as well as shading, petal shapes, leaves, stems and more. She shows step by step how to draw a fantastic selection of popular flowers including hollyhocks, lilies, sunflowers, tulips, gladioli and clematis, in a wide variety of media. She also demonstrates drawing flowers in the landscape and in containers. Suitable for beginners wanting to build up their confidence and more seasoned artists seeking inspiration, this book is a must-have for anyone who wants to draw flowers. 12 step by step projects. Drawing is the basis of all good work and in this practical guide, Margaret demonstrates drawing techniques in easy-to-follow stages. The media covered include graphite pencils, acrylic ink and dip pens, artist's pens and Conté crayons and the artist gives clear instruction on the basics, from line drawing and flower shapes to shading techniques and how to use lost-and-found edges to make your work more dynamic. There is also a useful section on using sketchbooks and photographs to gather information for later use. The rest of the book is devoted to individual flower demonstrations, including a gladioli, hollyhocks, lilies and sunflowers as well as mixed flower studies, blossom, dried flowers, flowers in containers and in the landscape. 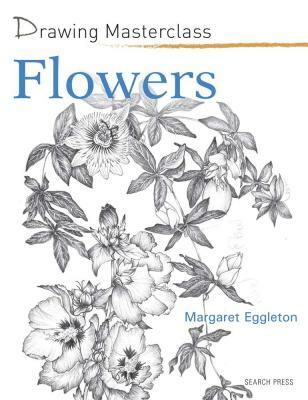 Margaret is an accomplished artist as well as a trained teacher, so the instruction is considered and clear, and provides a good basis for developing your study of flowers. However, I missed that aspect of colour so intrinsic to the subject and would have liked to see at least one section where colour had been used to enhance the drawing. It comes as a shock to turn the pages of this interesting guide and find a complete lack of colour. Of course there should be a clue in the title, but were so accustomed to colour, both in drawing and in the subject, that it just seems to be a given here. The feeling is also emphasised by the fact that the greys (because this is about line and tone) are quite dark and the images therefore quite strong. Get past that, though, and what you have is a very nicely done and, in terms of both styles and subject matter, very varied little book. Its stumbling point though, I cant help thinking, is going to be whether anyone is going to think, Ah just what I wanted or, because of its rather hard-edged appearance, But I do quite fancy trying it. Theres a lot you can learn from starting with a drawing, rather than reaching immediately for the paint box; you can learn it here, and I recommend you do. I just dont think the look and feel of the book are going to help me make my point, though.